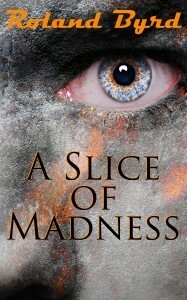 There is no Tomorrow is a story from my Science Fiction and Fantasy Anthology: A Slice of Madness. I hadn’t planned on posting this story on my blog, but when I woke this morning, it seemed the perfect thing to do. Enjoy! “C’mon, O’Connell, what’s it say?” His bear of a partner, Detective Hamner, asked. The other officers just stood there and looked at O’Connell with blank expressions. “Moron…thinks he’s gonna save the world!” O’Connell laughed. He gripped the note with fingers like banana slugs and shoved it at Hamner. Then he noticed the recorder, it was still running. “Hey, Ham. Check this out.” He peered into the recorder’s view screen and noted the blank wall centered in the shot. “What’s that?” Ham didn’t even look; he was enjoying the note too much. Since he was a boy Harold dreamt of time travel. Not the childish what if I could change that or go there type of dream. No… He dreamed endlessly of the mechanics and beautiful science that would make a time machine possible. As he grew, Harold took a quasi-normal approach to his teenage years. He learned guitar, wrote poetry, dabbled in mild narcotics, and dated girls—usually not the kind you’d take home to meet your parents. But through it all he was a closet scientist, always dreaming, always creating, in the forefront of his mind…the time machine, always the time machine. It was his one, true love. Upon graduation he was accepted into an Ivy League school—one of the best science programs in the nation. That was the end of the rock band he’d formed in eighth grade. The guys didn’t understand why he’d choose college over music. And they told him as much—in not so nice words. But what they couldn’t see, and this saddened Harold a little, was that science was the symphony of his soul and time travel was the concept album of his life. Within weeks of starting college, he made a name for himself as one of the brightest and most unconventional thinkers around. He spoke to any professor, or student, who could understand the advanced concepts he toyed with. He bounced ideas off them and considered their input. But he never gave more information than was required; only the essentials necessary to understand whatever he was working on that moment. He never revealed the entire scope of his dream. And so it was, when he published a paper on the possibilities and mechanics of time travel, most were stunned. “Why would an intelligent, respected man toy with something as foolish as time travel?” They wondered aloud. At least until they read the paper. Then they started talking—whispered conversations in hallways. None spoke openly, lest the scientific community frowned upon them. This is how most of the conversations went. Harold overheard some of his colleagues. But this didn’t daunt him. It only made his desire to prove his theories more powerful. It took a few years for Harold to gather the financial backing necessary to start building the time machine. But once he did, there was no stopping him. Sleep was meaningless, socializing…nonexistent. The women who noticed him were ignored; like meaningless shadows in a darkened room. Nothing could distract him from fulfilling his dream. Four years he labored lovingly on the device. Four years that were a blur of waking, working in his lab, and sleeping fitfully because his body occasionally demanded rest. Now, it was finally finished. Along the way Harold made another discovery; one that would make testing The Time Machine—he always thought of it as “The Time Machine”—more difficult. There was no future, and therefore no way to travel to it. You could only travel backward. Despite what some thought, time didn’t exist in all states at once. There was no overlapping of past, present, and future. Instead, time was a radiant blast, like photons shooting randomly from the Sun. The path of the past was traceable, known. All the variables could be factored. Therefore it was possible to plot a course to a single instant in the past and travel there. But the present…the present was different. It was like the surface of a star—a violent churning mass of uncertainty. The future didn’t exist yet. It couldn’t be plotted or traveled to because it was created every instant by billions upon billions of variables, all interacting in unknown, unpredictable patterns. Harold surmised that once you traveled to the past, you could never return to your present. The time-line from which you came became an unreachable point lying somewhere beyond the random chaos of your new present. The place and time you came from would continue without you, a forever inaccessible tangent. There is no tomorrow—not in time travel, not in reality. There is only the present and the past. With this in mind Harold planned his tests. The tests all went the same. Like ill-timed strobes, the lights flickered and dimmed. Angry insects seemed to fill the room as the current crackled and buzzed. Plasma ghosts danced around the machine. Harold’s hair formed a static halo, like a puffer fish around his head. Then the room grew cold, thunder split the air, and it happened. The object in the machine vanished! It didn’t matter if he sent the object back twenty seconds or twenty years; he never saw it again. He trusted his calculations implicitly, but he could never see the result. Still, as he worked he developed a strategy. On Friday October 16, 2020 Harold was ready. After the campus emptied, he carried out his plan. On Saturday October 17, 2020, the police arrived to question him about a recording that showed someone who looked like Harold stealing an arsenal of weapons and ammunition from a local gun dealer. They found a note and his digital recorder, still running, in his lab. It was all Harold left. Detective O’Connell joked about the lunatic scientist who thought he was a hero. They all had a great laugh, until the recording started playing. Then their chuckling died. Detective O’Connell’s mouth gaped like a seal gasping for air. The rest stood stunned, eyes fixed on the screen. They watched as Harold sat in the middle of the room. The stolen weapons, piled like a mercenary’s dream around him. One by one he loaded them and placed the weapons in a large spherical device. When all the weapons were in the sphere, he put the remaining stacks of ammo inside. Then Harold punched buttons on some sort of control pad and stepped in. The sphere door hissed shut as pressure locks sealed. A single window in the door reminded O’Connell of a ship’s porthole. Harold stared at the camera through it. His eyes were hard, determined. His mouth fixed in a bloodless line, jaw muscles bunching. O’Connell had seen that look before. In the war, soldiers wore the same expression when bent on doing something brave—or stupid—because they thought they could make a difference. The sphere shimmered, the lights dimmed, the crack of thunder split the air, and the machine vanished. The rest of the recording showed the empty room, empty all weekend until O’Connell and his men arrived on Monday. Vanished. O’Connell thought. Now how in the world am I supposed to explain that? He’d never have believed it if he hadn’t seen it with his own eyes. He wasn’t sure he believed it anyway. A quick glance told him Ham and the others were also struggling with what they’d seen. O’Connell read the note again. He looked from it to the screen and back repeatedly as he studied it. Maybe the scientist wasn’t so mad after all, he thought. O’Connell never laughed about the crazy scientist again. He silently tipped his hat to the man who’d taken on such a fierce task. He left the room shaking his head. They’re never gonna believe this at the precinct. In our time line we’ll never know what happened to Harold. He can’t return to us. His life is reduced to a police file and a digital recording…his last act of defiance. But maybe, just maybe, he succeeded; and there’s another timeline where the Twin Towers still stand.